This is not a very popular baby shower game but this game is unique and new. 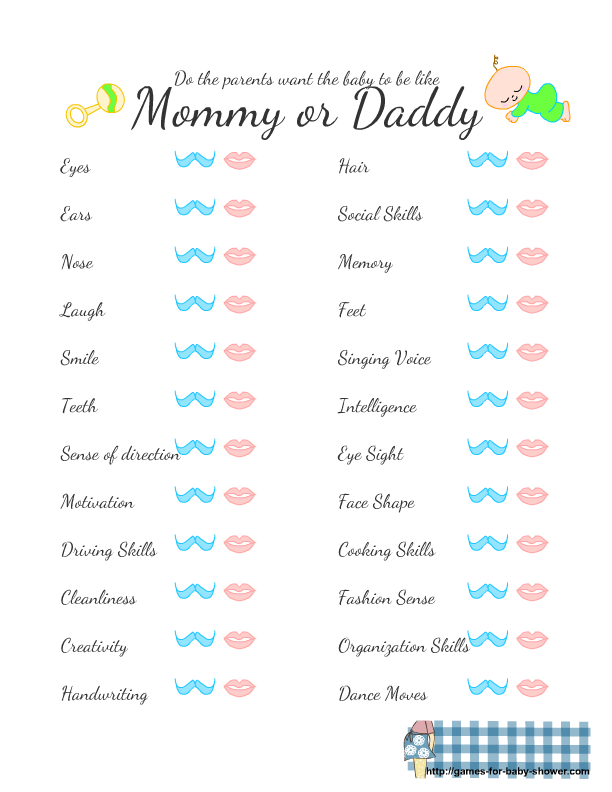 This Free Printable Do the Parents Want the Baby to look like Mommy or Daddy? Game will be a fun addition to your baby shower party games. I have made some cute and super adorable game cards for this game that you can print using any printer at your home. You can also get these printed from some print shop according to the number of your baby shower party guests. How to Play: Take printouts of this mommy or daddy game according to the number of your baby shower guests and also keep a copy for parents-to-be. One day prior to the baby shower, ask the parents that whom do they want baby to look like? Do they want the baby to look like mommy or the daddy? Circle the answer given in front of each feature and circle the choice of the parents. This will be the answer key. Ask the guests that Do the parents to be want the baby to look like mommy or daddy? Ask them to circle the answer that they think is right in their opinion. Check the answers given by the guests according to the key that you have made already. The guest with most correct answers will be the winner. This is the first free printable of this game and it is deocrated with an adorable baby who is wearing a pink dress. Just click on the thumbnail image that I have shared above and a bigger image will open up, you can right click and save that. This is another cute image for this fun baby prediction game. This image is decorated with a cute baby who is wearing green colored clothes and this game card is also decorated with the image of a rattle. Just click on this thumbnail to get the bigger prinatble image. This is another free printable image for this game that is decorated with a blue baby and a blue rattle.